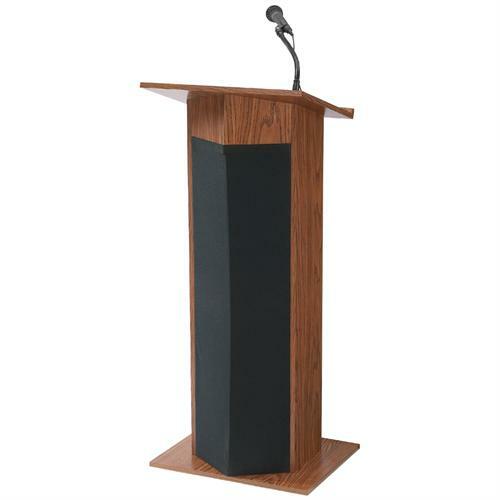 More on the Oklahoma Sound Power Plus Lectern (Medium Oak) 111PLS-MO below. 30-watt amp is ideal for venues like smaller conference rooms, meeting halls, auditoriums and cafeterias. Large 20.5" wide by 6" deep shelf space provides convenient storage. Includes an amplifier that works with OS wireless microphones. Multimedia capabilities include simultaneous usage with two wired and one wireless (optional) microphones. Features input jacks for CD players, extension speakers, recording outputs and playing MP3s.